[“Desiring to understand the glory of Radharani’s love, the wonderful qualities in Him that She alone relishes through Her love, and the happiness She feels when She realizes the sweetness of His love, the Supreme Lord Hari, richly endowed with Her emotions, appeared from the womb of Srimati Saci-devi, as the moon appeared from the ocean. 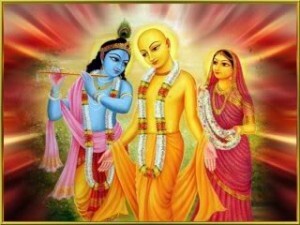 Krsna was trying very hard to understand the nature of Srimati Radhika’s affection for Him. After the attainment of prema there is sneha (melting heart), then maan (sulky mood) and then pranaya (a sense of oneness with one’s beloved). Pranaya means very deep affection. After pranaya comes raga, anuraga, bhava, mahabhava, and ultimately Radhika’s madanakya-mahabhava. Krsna was trying to understand the glory of Radharani’s pranaya, Her love for Him. He was thinking, “I feel happy upon seeing Radha; but when She sees Me, She becomes completely maddened. What is in Me that She tastes?” I cannot taste the extent of My sweetness as She can. 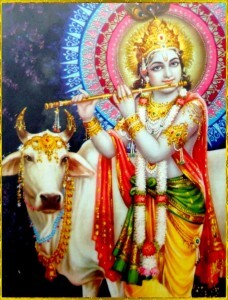 How can Krsna taste His own sweetness? He cannot do so. Only Srimati Radharani can taste His sweetness completely. Krsna had a desire to understand what Radhika experiences. He was thinking, “I am the most beautiful personality in the entire world. No one is more beautiful than I. But Radhika is much more beautiful than I. And yet there is something in Me which drives Her mad upon seeing Me. What is that thing?” He could not understand, and He thus developed greed to taste His own sweetness. 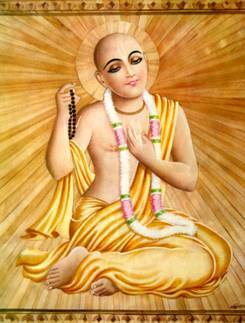 In order to do this, He descended as Sri Caitanya Mahaprabhu. Krsna is rasika-sekhara. He is the crest-jewel of all enjoyers. He is the ocean and embodiment of all devotional mellows, and He is the supreme taster. 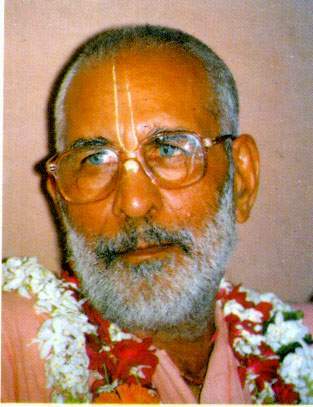 He is also parama-karuna, the most merciful. Because of these two qualities He descended to this world. He came to taste something Himself, and He also came to give something raga-marga, the path of spontaneous attraction. Just hear the pastimes of Sri Krsna. Study the commentaries of our acaryas. The Srimad-bhagavatam has described how Lord Krsna’s cowherd-boy friends, headed by Sridama, Subala, Arjuna and Stoka-krsna, love and serve Him. Nanda Baba and Mother Yasoda also have love for Him. The Srimad-bhagavatam also describes the love of the gopis and their service mood towards Him. 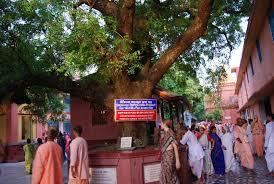 The service of these eternal associates in Vrndavana is called ragatmika. Those who try to follow in the footsteps of these ragatmika devotees are called raganuga. Anugamana means to follow. On this night, 520 years ago at the time of the lunar eclipse, in order to avoid the bad effects of that eclipse, millions upon millions of people entered the Ganga and chanted “Haribol, haribol.” At that time the Muslims were thinking, “All those Hindus are chanting harinama and Hare Krsna.” Thus, they also chanted “Haribol, haribol”, and in this way they were chanting nama-abhasa. Somehow or other everyone was chanting the holy name at the appearance of Sacinandana Gaurahari. Mahaprabhu’s mother, Sacimata, had lost her first eight sons, and therefore she gave this child the special name Nimai. Nimai was born under a neem tree because neem keeps away ghosts, witches and evil spirits. When a parent loses children, they give the child a special name in order to protect their child so Yamaraja will not take them seriously. 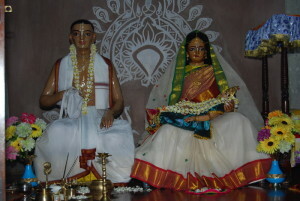 When He was in Jagannatha Puri in the association of Sri Svarupa Damodara and Sri Raya Ramananda, He tasted the ecstasy of Srimati Radharani in the small room of the Gambhira. How high were His bhavas there! Somehow or other He would escape by passing through the seven locked doors of the Gambhira, even though they remained locked. He would roam about in transcendental ecstasy. The ecstatic emotions He experienced in Jagannatha Puri are to some extent described in Sri Caitanya-caritamrta. Tomorrow is the last day of our parikrama, and after that everyone will be returning to their homes. My Gurudeva used to say, “When you go home, don’t tell anyone of the problems you experienced here, such as the heat and bathrooms. Rather you should tell everyone, “There were no problems at all at the Kesavaji Gaudiya Matha. There were a variety of subjis (vegetables) and air-conditioned rooms and attached toilets. Premananda prabhu gave everyone rasagulas (a fancy Bengali sweet) and parathas. We had great happiness.” Don’t tell anyone about the problems you may have incurred during the parikrama. Rather you should glorify the parikrama. Preach, and next year each of you should bring two or three more people. This year there were 15,000 pilgrims on parikrama, and next year we will make arrangements for 30,000 pilgrims. Now there will be an enactment of Sriman Mahaprabhu’s pastimes in the Bengali language, performed by a Bombay dance-drama group named Nritanjali, whose leader is Mr. Tushar Guha. Please stay for that.